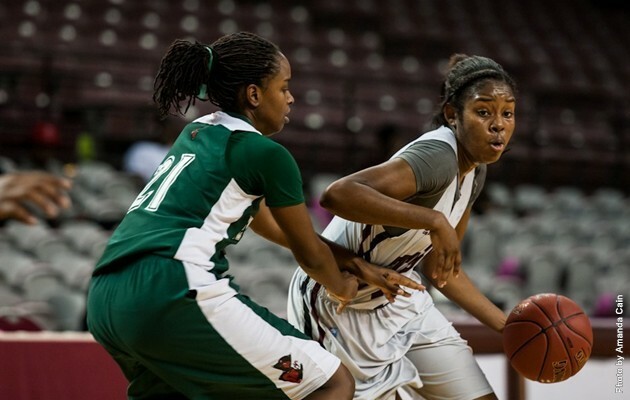 HOUSTON – The Texas Southern Lady Tigers continued their 13-game winning streak with an impressive 84-71 victory against SWAC opponent Mississippi Valley State on Monday evening. The Lady Tigers got off to a slow start as MVSU got an early 17-6 lead in the first half. But with critical turnovers and costly fouls on MVSU, TSU slowly chipped away at their deficit and after a three pointer from senior forward Gianne Fleming the Lady Tigers subsequently tied the game at 31-31 with 4:40 left to go in the first half. It went back and forth up until halftime with the score being tied 38-38 at the break. During the second half MVSU struggled to hold on to the ball giving TSU valuable possessions as the Lady Tigers began pulling away with the lead and never looked back opening up a double digit margin in the second half of play. When it was all said and done the Lady Tigers picked up their thirteenth straight win and remained in sole possession of first place in conference play. Sophomore Morgan Simmons led all scorers with 22 points and 4 steals. Freshman guard Te’era Williams was a perfect 10-10 from the free throw line with a total 20 points for the game to go along with six rebounds. Fleming (18) and Kayla West (13) rounded out the list of Texas Southern double-digit contributors. TSU outrebounded MVSU 40-37 and controlled the tempo of the game for the majority of the contest. Texas Southern had 24 points off of Mississippi Valley State turnovers over while also outscoring MVSU inside the paint 36-26.The Lady Tigers also capitalized on fast break points with 14 to MVSU’S 4 points. The Lady Tigers will travel this weekend to Alabama for a two-game road swing against Alabama A&M and Alabama State on Saturday, February 23 and Monday, February 25 respectively. TSU will return home on February 28 against Southern. Texas Southern currently sits in first place in conference play. Head coach Cynthia Cooper Dyke is now only 4 victories shy of reaching 150 wins as a head coach. The Lady Tigers have now won 13 straight games dating back to Jan. 4. *Texas Southern has set new school records for consecutive wins (13) and overall wins during the regular season (16).